I went out onto Pittwater yesterday arvo with a coupla mongrel mates. We grabbed a few beers, a four kilo spin stick each and a handful of 5-10 gram chrome lures. It wasn’t long before we were into the fish. Between us we landed around 30 tailor, and a solid bonito. The boys I was with both work on Pittwater and have a crab operation running between ’em through the summer months. As we re-baited the traps with frames of the fish we had just caught we managed some prime blue swimmer crabs. I brought them home and cooked up a good feed tonight. I find with a nice delicate meat like crab you want to cook it simply. Simple flavours of garlic, parsley and chilli. Served up with a nice white I bought when I was up the Hunter Valley last. Fresh clean flavours. Beautiful! 1. Cook the crabs and pick all the meat out of them and place in a bowl. I left the meat in the claws but its not essential. 3. When the pasta is almost al dente warm a pan and put 6 tablespoons of olive oil in. 4. Once warm place in the garlic and chilli in and infuse the flavours into the oil. 5. After a minute or so throw in the parsley and crab meat plus any juices from the crab meat. Mix the whole lot while warming it. Add salt and pepper to taste. 6. Pasta should be done now. Drain and place in a bowl. 7. Add the crab and mix it through. 8. A generous pour of olive oil on top. Sprinkle some fresh parsely in and squeeze a half lemon over the lot. Thanks! There’ll be plenty more to come. 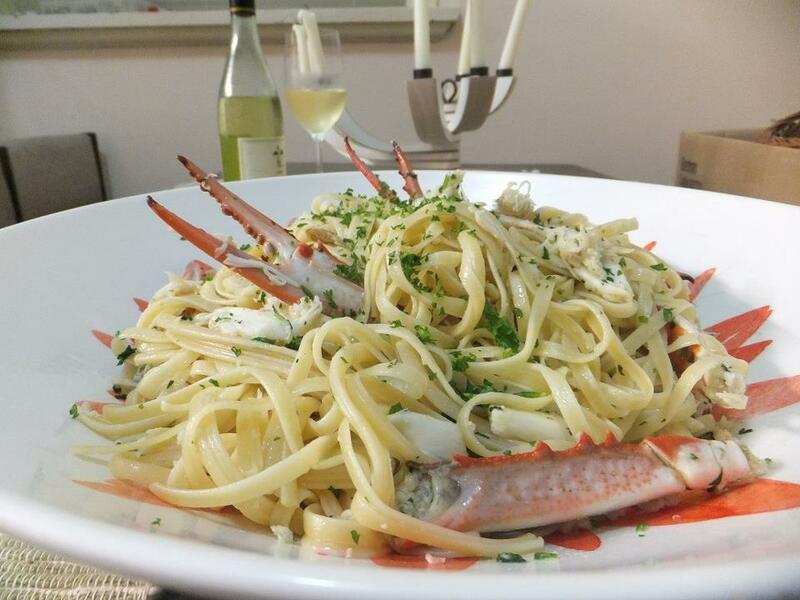 This entry was posted on April 21, 2013 by gourmetandy in Recipes and tagged blue, crab, crustacean, fish, fishing, gourmet, hunters, linguine, oil, olive, sustainability, sustainable, swimmer.